Have a tech question or tidbit you wish to share with the other Ranger Tug owners? Post it here. A few months ago, there was a discussion about the date for the tides display on the Garmin 5212 chartplotter reverting to 1999. On my unit, it was June 1999. At the Florida rendezvous, the Garmin rep knew what caused the issue and had the fix. The anomaly originates in the GPS antenna. The fix is to update the antenna software to version 2.90, which he had with him on an SD card. It took less than five minutes. If your 5212 has the same problem, the update can be downloaded on to an SD Card from the Garmin website. Today, I cruised from Punta Gorda to Captiva and tides worked like a champ. The same Garman rep at the same Rendezvouse applied the same fax to my Garman chart plotter. I requested help because in addition to the dates, the tide prediction was not working. The fix worked for one day. The date is correct but the tides are blank again. How do you install the antenna software update? I understand how to get it onto an SD card, then what? Just put in the card and turn on the 5212. Installs itself. Based on the photos on the Garmin site I have a GA-38 antenna. Looking for software/updates there is nothing. Is this the antenna you have? Anyone have a good link to the software update location? I have a chart update purchased from a Garmin. If I remove the update chart SDcard, tides work. Reinstall the card, no tides. If the message “Windows Protected your PC appears, then select “more info” followed by “run anyway”. 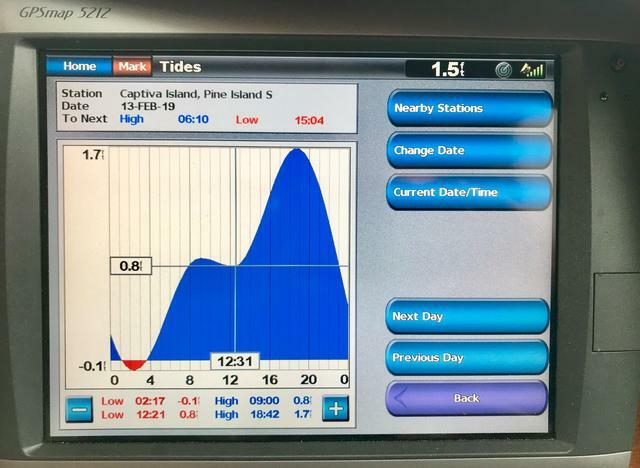 The update will begin, updating the connected device as well as any other compatible accessories or devices present on the NMEA 2000 or Garmin Marine Network. IMPORTANT: Do not remove the software update card until the device fully reboots and "I Agree" has been selected on the Warning screen. Removing the software update card before the process has finished may corrupt the operating system and may cause the device to become inoperable. *If current software version is below 4.10, a 2 GB SD card will be required. This applies to 400, 500, 4000, 5000 series devices. The tides displayed on the 5212 mirrored exactly those displayed by the Navionics app on my iPad. Updating the GPS antenna to software version 2.90 has resolved the date issue for my 5212. Thanks, this is a huge help. I’m at 2.90 and my tides work only when the Garmin chart card is removed at startup. Garmin says I have to be at version 3.0 and need Windows to do the update. My date is at ‘99, they call 3.0 the ‘Rollover error.” Hope they are referring to the century and not the boat. Apparently the update Garmin put on was not the latest. 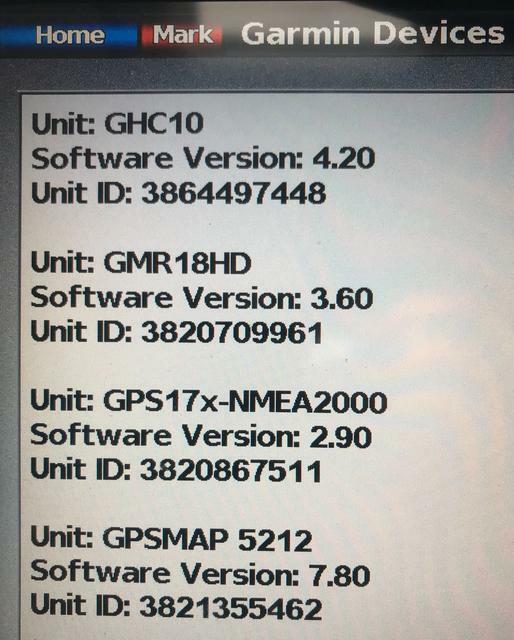 The latest software version on the Garmin website for my particular GPS antenna is 2.90. I do not have updated charts that require an SD card for functionality. When I navigated from the Burnt Store rendezvous marina to ‘Tween Waters on Captiva, I actually used Navionics and SEAiq USA on my iPad Pro 12.9 for navigation more than the 5212 chartplotter. The Burnt Store-‘Tween Waters trip was the first leg of a 275 mile section of the Great Loop. For the subsequent legs this trip, I’m going to experiment with using a split screen on the 5212 to display sonar and radar and use the iPad apps for navigation. For those not familiar with SEAiq, it’s the paper charts displayed electronically and they are updated weekly so they’re actually better than paper. It’s the best deal in boating— $4.99 for unlimited up-to-date-charts. I have a second iPad on board for backup. captstu wrote: Where is the antenna? Mine is located on the mast, above the radar dome. Mine is located on top of the "stack". My R25 is fitted with a 5212 and a GPS17 antenna via the NMEA2000 bus. Last week at the Ranger Rendezvous, a Garmin representative installed the "latest" software to fix the date problem related to tides. It worked while he was on the boat. At the next power up, it failed and reverted to an earlier June date from years ago. The first call to Garmin said I had to replace the antenna. The second call referred me to a later fix for this antenna only - it fixed the previous fix. I installed it today and tides and date are now correct. This fix is supposed to fix the upcoming epoch problem in earlier GPS. Specifically, the Garmin and referenced antenna determine the date by counting the time intervals since "birth". The field overflowed a while back and will overflow sometime in April of this year again. Last time many GPS just failed, apparently the Garmin still computes position but fails at tides. Anyway, it seems fixed now.